At the University of Florida, several children are treated with Vein of Galen malformation each year. Please contact our office at (352)-273-6990 for more information. 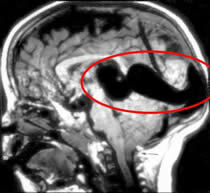 A vein of Galen aneurysm is congenital malformation of blood vessels of the brain that occurs prior to birth. Specifically, it is a malformation that shunts blood from cerebral arteries into a dilated vein of Galen (a deep internal cerebral vein). This malformation shunts blood from the arteries into the veins rather quickly, increasing overall blood flow and, in turn, increasing the work of the heart. The result can be cardiac failure, which is the most common presentation of this disease. Neonates characteristically have multiple fistulas. Up to 25% of their cardiac output passes through the fistulas causing high-output congestive cardiac failure. The cardiac manifestations can range from cardiomegaly to severe cardiac failure. Infants and children usually have a single fistula with a smaller shunt. Cardiac manifestations are usually not present. This age group typically presents with hydrocephalus from obstruction of the aqueduct of Sylvius (part of the normal CSF drainage pathways). Patients with longstanding cerebral venous hypertension may also present with delayed milestones. A high number of these children present with failure to thrive. Older children and adults usually have low-flow fistulae. These patients usually present with headache and seizures. A small number of patients may also present with developmental delay, focal neurological deficits, proptosis (bulging eyes) and epistaxis (bleeding nose). Subarachnoid hemorrhage and intracerebral hemorrhage can occur in this age group due to rerouting of blood into surface veins. Diagnosis of a vein of Galen aneurysm is usually made in-utero. The widespread use of routine antenatal ultrasound examinations has enabled the detection during the third trimester of pregnancy. MRI is the neuroimaging modality of choice for evaluating these lesions. It can demonstrate the location of fistula, presence of any nidus, the arterial components, the venous sac as well as the status of venous drainage. Definitive treatment involves arterial or venous catheterization and injection of glue or coils into the lesion to close it off and stop the shunting of blood. Another method of treatment involves placement of trans-torcular coils into the lesion. A needle is introduced into the back of the head into the venous system of the brain and metal coils are placed in the Vein of Galen to occlude it. This method was originally developed at the University of Florida. Several of these embolizations procedures may be needed to shut off all the vascular communications. This is usually done over a period of months before the child is two years old. The timing of endovascular management is determined by the clinical presentation of the patient. Cardiac failure in a neonate that is not responding to medical treatment is an indication for emergency embolization. The goal of therapy in such patients is to arrest the congestive cardiac failure rather than to achieve complete obliteration of the shunt. 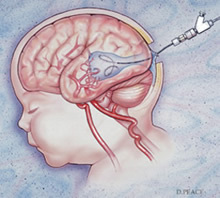 In a child who has not presented with cardiac failure, the aim of endovascular therapy is to prevent consequences of chronic cerebral venous hypertension and to promote normal cerebral development.